Learn more about you can start capturing online customer feedback for free below. Magento is a leading, modern cloud commerce platform with an open-source ecosystem. It offers solutions for all business types including B2C, B2B and hybrids. The Magento Marketplace houses thousands of extensions and themes (both free and premium). 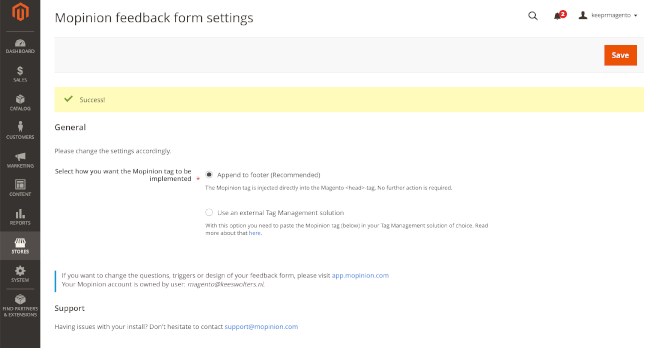 And now any one of the thousands of websites using Magento can download the Mopinion extension and have feedback forms running on their website in just seconds. Click on ‘install extension’, which will redirect you to the Keys page. Users can set up the forms so that they are triggered on specific parts of the website such as certain pages, posts, or funnels by going to the deployment section using your free Mopinion account. These feedback forms are also completely customisable, which is great for branding purposes. Users can add and/or change the feedback questions, alter the design of the form, change the logo and set up their own language. Screenshot: Go to Stores > Settings > Mopinion Feedback Form. These are the steps you must take to edit the Mopinion settings. All feedback collected on your Magento site is then available on your personal Mopinion account, at app.mopinion.com where it can be viewed in your Mopinion inbox. This is created the moment a user has installed the extension. Users can also choose to have feedback alerts sent straight to their email inbox. Many other feedback extensions have feedback forms that are more comparable to contact forms. Their only capability is to collect feedback and forward it to your email. Such a simplistic tool prohibits the user from taking advantage of key features such as smart triggering (e.g. displaying feedback forms based on certain events), which is very simple to configure in the Mopinion extension. Screenshot: Here you can configure your feedback form. Additionally, many of these extensions do not offer much in terms of customisation – such as adding a logo, altering the questions or changing the language within the feedback forms. Alternatively, there are other extensions that offer a feedback solution but require the user to have an existing account their their software before making use of the extension. 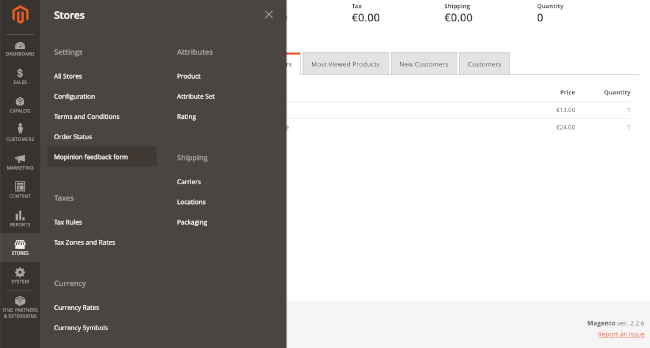 Should the Magento user not yet have an account with the software, they often have to register for an account separately from their Magento admin (on the site of the extension creator), get the proper code, install the extension and enter the code in Magento. With Mopinion, users are able to skip over all of these extra steps. The account is created simply upon downloading and activating the extension. Mopinion is a rapidly growing SaaS provider and market leader in the field of online customer feedback analysis for websites and apps. Our solution turns feedback from digital touchpoints into actionable data to drive strategy, improve online channels and empower digital teams. The Mopinion Suite, or paid version of our software, enables organisations to gain real-time insight into how customers experience their digital channels and what actions they need to take to retain them. It offers both feedback collection and analysis solutions as well as includes various action management tools that enable marketers to close the feedback loop. Download and install the Mopinion extension for free below.